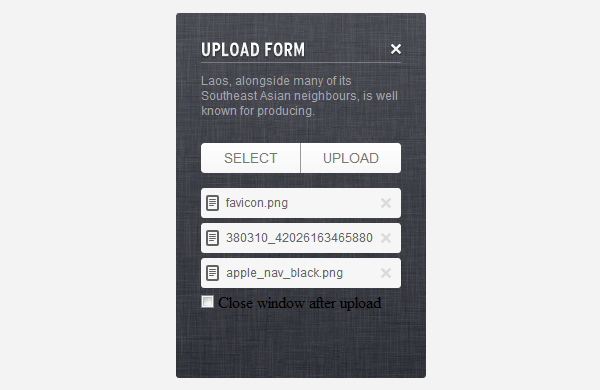 In this tutorial we will code an Upload Form from Impressionist UI. We will code it using the Plupload API. 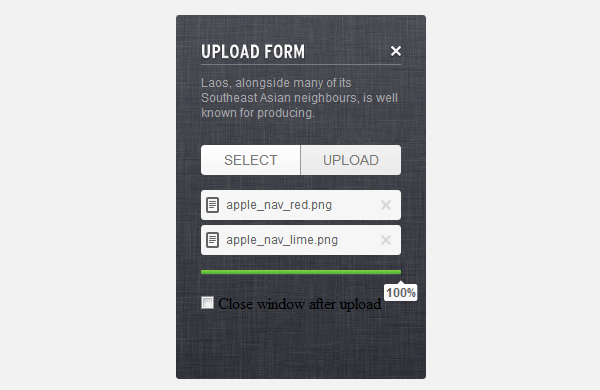 Plupload allows you to upload files using HTML5 Gears, Silverlight, Flash, BrowserPlus or normal forms, providing some unique features such as upload progress, image resizing and chunked uploads. This way we are able to create a very powerful upload form compatible with all browsers. So let’s get started. The file structure is very simple. First you need to download the “Plupload API” and the “jQuery UI Progressbar”. Then create all the necessary folders and add the files mentioned bellow. css – Add here the .css files. img – Add here the images. js – Add here the scripts. uploads – Here will be saved the uploaded files. Create a <div> with the class “upload-form” and id “uploader”. Then we need to add the heading, the close button, the text paragraph, the select and upload buttons, the <div> were we will add the selected files, the progress bar and the close after upload checkbox. Next think that we will do is adding the JS scripts that we will use on our upload form. So we will start by adding the jQuery API, I’ve used the one hosted by Google CDN if you want you can download and host it on your own server. Next you need to add the “plupload.full.js” and the “jquery-progressbar.min.js” file. Add all this scripts to the <head> of you page. 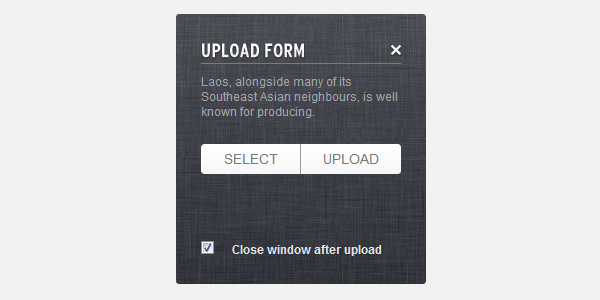 In this step we will add the upload form functionality. Without this code it will not work. I’ve explained what does each piece of code with inline comments. Make sure you read them. If you have any question you can post on the comments. For more configuration setting you can read the Plupload Documentation. runtimes : 'html5,flash,silverlight', // Set runtimes, here it will use HTML5, if not supported will use flash, etc. uploader.init(); // Initializes the Uploader instance and adds internal event listeners. // When the user select a file it wiil append one div with the class &quot;addedFile&quot; and a unique id to the &quot;#filelist&quot; div. // If an error occurs an alert window will popup with the error code and error message. Now we’ll start styling our form. First we’ll add some reset styles to the elements that we will be using. Then we’ll style the form container: add a background pattern and a css3 gradient on top; set the width to 200px (the total will be 250px because of the paddings); set the minimum height to 180px (the total will be 270px because of the paddings), we need to set the minimum because when we will add files to upload the box will need to be bigger; and add the rounded corners. We will also add a clear floats class to use it further. To style the title we will set the font, the size, the color, etc. In this form I’ve added an image for the heading, so I’ve created a new class “replace-text” to replace the text with the image, basically we are hiding the text using the text-indent property and adding the image as a background. For the close button we will set the width and height and position it on the form container. To finish we will add some basic typography styles to the text paragraph. Let’s style the buttons. We’ll start by adding the styles for both of them (css3 gradients, font, size and color, etc.). Then we will style the select button: set the width to 99px; make the left corners rounded; add a right border. 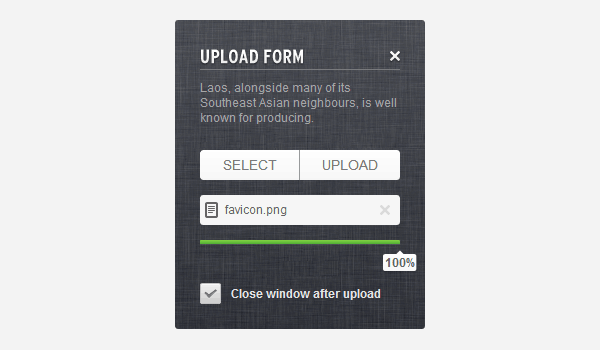 For the upload button we will set the width to 100px and make the right corners rounded. In this step we will style the selected files that were added to the upload queue. We will give some basics styles to it (background, typography, size, etc.). 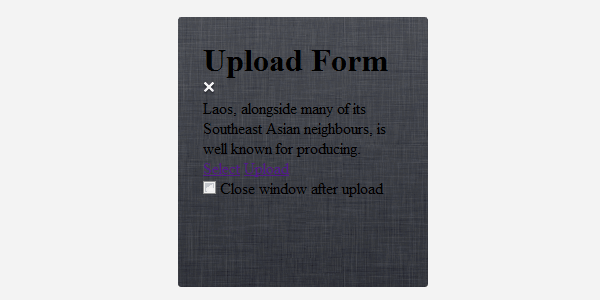 Then we need to style the “remove file from queue button”, the styles are also basic (width, height, background, etc.). Now it’s time to style our upload progress bar. As we are using the jQuery UI progress bar we need to use the classes generated by the UI in order to style it. We will start by giving a 4px height and 1px border radius. Then we will add a default background color and some shadows. After that we need to style the uploaded progress using a green css3 gradient. To finish we will style the tooltip that will show the uploaded percentage. As we can’t style checkboxes, the easiest way that I’ve found to style theme using only CSS it’s by replacing the checkbox input with a span tag. This will work this way: first we will hide the checkbox input and style the span tag like a checkbox and then we will update the checkbox using jQuery. So when we will click on the span tag jQuery will update the checkbox input to selected, and when we will click again the span tag jQuery will remove the “checked” from the checkbox input. First we’ll add the “js” class to the body tag and make the checkbox “checked” by default on load. Then we will check if the checkbox is checked and if the result is false the checked class will be removed from the span and if the result is “true” the checked class will be added to the span tag. And also we will update the checked / unchecked state to the hidden checkbox. Open the upload.php file and comment this line $targetDir = ini_get("upload_tmp_dir") . DIRECTORY_SEPARATOR . "plupload"; and uncomment this one $targetDir = 'uploads';. We finished this tutorial. 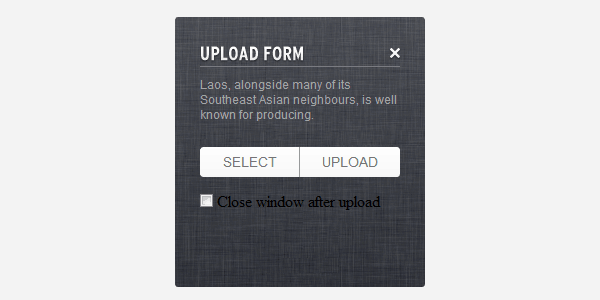 Now you have a great upload form that you can use on your projects. If you have any questions post it on the comments section. Don’t forget to subscribe us for more tutorials and great articles. Valeriu is a Web Designer & Front-End Developer currently living in Lisbon, Portugal. He creates some cool stuff using CSS3 and HTML5. You can follow him on @vtimbuc, Google+ or visit his web site at vtimbuc.net. Is it possible to connect to a Database and update an ID? I want to upload image1, image2, image3… to a given ID. This upload uses the same plugin as wordpress (Plupload). If you have some php knowledge you can link and save and update ID’s to the database. For more information you can read the documentation or ask on the forums http://www.plupload.com/. And attach to upload complete event the code to save it on the database. If two different visitors to my site upload an image with the same name will the first image be overwritten? I’m still uncertain how the server handles that. No it will add an number at the end, you can also use a setting (unique_names : true) to generate unique files names. when i upload the file in the directory, nothing happens; there aren’t files in the folder. Is there an easy way of “echo’ing” back the uploaded file name / link when uploads are completed? Basicaly I woud like to see the “download” link when done with uploading. Thank you for this great peace of code! How can i setup the max numbers of files ? I need to allow users to upload just 5 files. check the download button in the body of tutorial. Your code is very nice. How to show preview image. This is awesome! Is there a way for the user to add a title and description to each image that is uploaded so that it can be pulled at later time? For example, an artists page where they want to upload images to different categories, add titles and descriptions which would then be displayed onto the site? I know this might be long winded, but if you’ve worked on something similar to that I’d love to see it or know if this can be modified to suit those requirements. I changed the file size, but was wondering if there is an easy way to get notification via email if someone upoads to the site? Is there a way to just include HTML4 and HTML5 support? I don’t want heavy upload for my site since Its main priority is not to accept uploads, I want to fall back to normal “preloader” if user doesn’t have HTML5. Love this script. Spent months looking for a customized ui for plupload and finally found this. Great work. One question however. I am requiring a callback function after the upload has completed. The default plupload functions have an init and pre init setting that I was previously using before I found this. I have attempted to add the init: setting into the general settings section but does not seem to work. Any help here would be greatly apreciated. If I use the latest version of PlupLoad (1.5.6) then this form doesn’t work, however if I use the one included in the download from designmodo it works fine. Any ideas? and would you be so nice to share your solution how to add video? Is there any way to integrate this with Dropbox or Skydrive? I changed the max file size allowed, but it seems to be limited. What is the largest file size this can be set to upload successfully and why? Thanks for the tutorial, I had a lot of fun with this! Nice post and clear code! which is the id of the file object so then i can read it? 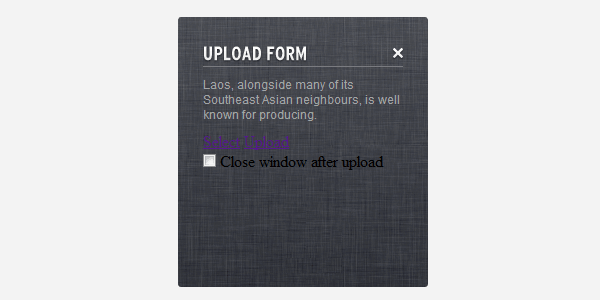 I would like to move the Upload button outside the box, change it to Submit, and use it with form data, i.e. name, address, phone numbers, etc. and submit the form (with or without uploads)? Is this possible with this code? I am forcing raise the error on the server size and setting the properly error object. But, not able to see them on the upload form. Is there way that i can access the server side errors as they are being returned as Json data. Will this script run on a WildFly (Jboss) server ?